Strong and durable, Savvy Rest’s matching natural, organic foundations replace the box spring in any bedstead or bed frame to support your latex mattress. They are available in two standard heights. The organic coir bed rug adds air circulation for solid-platform beds. 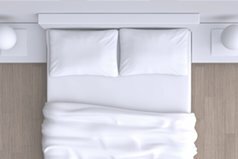 The platform bed insert gives strength to any existing bed frame. Our matching foundation replaces the boxspring in a bedstead or frame. The bed rug is porous and allows air circulation between the bottom of a mattress and a platform bed's surface. An economical addition to any bed frame. Savvy Rest's original platform bed, the Afton, is made with timeless simplicity to suit any decor. An essential part of modern comfort. But what type is best for you? Find out here.